I recently came across this photo while doing research on the history of textiles in lower Manhattan, the Lower East Side specifically. It is a poignant photo of an Italian immigrant woman holding her carefully swaddled baby in her tenement flat on Jersey Street. 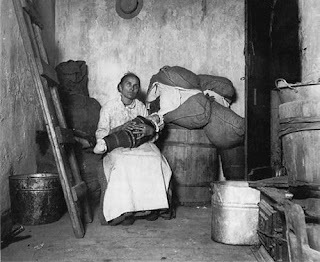 Photographed by Jacob Riis, creator of the photographic series, 'How The Other Half Lives' (1891), this image speaks volumes to textiles as a means of survival. Riis was one of the first photographers to use flash, and though viewed to be a muckraker and visual journalist, he was also later criticized for his deprecating views on women and certain ethnic groups.